The aerial is embedded into the window glass. When washing the inside of the window which has an aerial, use a soft cloth dampened in lukewarm water, gently wiping the aerial lines. Use of glass cleaning products could damage the aerial. To remove the aerial, turn it anticlockwise. To install the aerial, turn it clockwise. Make sure the aerial is securely installed. To prevent damage to the aerial, remove it before entering a car wash facility or passing beneath a low overhead clearance. Be careful around the aerial when removing snow from the roof. Otherwise the aerial could be damaged. 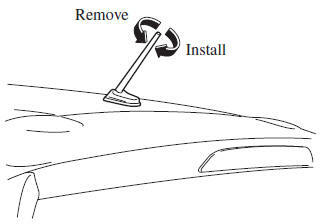 When leaving your vehicle unattended, we recommend that you remove the aerial and store it inside the vehicle.